The kitchen tends to get neglected. Everyone wants a big living room or a large bedroom or a walk-in closet. Meanwhile, the kitchen is the smallest space in your home. Luckily there are many ways to work with a small kitchen that don’t involve an entire remodel. Before we start saving space in the kitchen, we need to prioritize and organize what’s already there. It’s time to be realistic about how you use your kitchen. Are you an avid cook, making meals 2-5 days a week? Or do you store sweaters in your oven and have your local take out on speed dial? Either way, you will use your kitchen in different ways. If you use cookbooks regularly, you will need to find a focal, easily accessible spot for those. If the microwave is your best friend, that will also need a convenient location. Pick and choose what you use your kitchen for and write down those priorities. It will make organizing and picking the right space saving gadgets easier. One of the biggest kitchen flaws that I have found is the lack of cabinet space. Every kitchen I have lived in lacked an adequate amount of space to store everyday items, like glasses and plates. Luckily, there are many gadgets out there that were created to fix just that. Vertical storage: There is nothing worse than rummaging through stacked cookie sheets and muffin tins, making loud noises and disgruntled sounds. On top of that you make a big mess that takes up an entire cabinet. Instead, start storing your cutting boards, cooling racks, and serving trays vertically in your cabinet. There are a few different racks that you can buy to help you organize, but you can also use dowels from the harware store. Lazy Susan: This age old gadget has been helping cooks organize kitchen items for years. It started as a built in feature, but now Lazy Susans are portable and come in different sizes and materials. The smaller ones with multiple levels are a favorite of mine and really keep things organized. They are perfect for storing smaller pantry items, like spices and teas. Wine glass rack: This might not be for everyone, but if you have a plethora of wine glasses, in different shapes and sizes, this is for you. Wine glasses take up more space than you think and if you have more than four, you are going to need a couple shelves to store them. Instead of using the kitchen cabinet, try installing a wine glass stem rack. These durable devices come in metal and wood and can be hung on the wall or installed underneath your cabinet. You can find them in different sizes; I’ve seen some hold six glasses and others up to 18. While the walls of a home typically display beautiful pieces of artwork, in the kitchen walls become a multipurpose zone. There are multiple storage options that can easily be mounted to your kitchen walls, saving you cabinet and counter space. Wall-mounted magnetic knife holder: This device is one of the more genius storage savers. It’s known widely for substituting that chunky wooden knife block that awkwardly sits on the counter, taking up space. Famous chefs use them, it only makes sense that we should too. Pot rail: These simple metal devices have been trending on kitchens walls everywhere. As minimalistic shelving has replaced classic kitchen cabinets, cooks have reinvented ways to store their everyday utensils. Try installing a rail above your sink or underneath an open shelf to hang different sized utensils and pots. 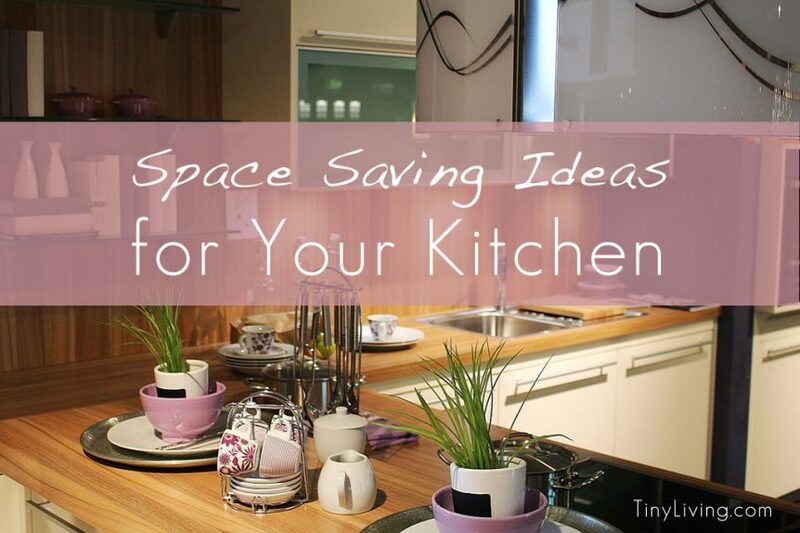 Who knew that saving space was trendy too! In a small kitchen, counter space is sacred. In order to take advantage of the counter space you have, try storing some of your items in other areas of the kitchen using space saving gadgets. Mounted paper towel holder: It’s simple really, but it makes a big difference. Instead of using a stand up paper towel holder that you would put on your countertop, use one that installs below your cabinet. Those extra inches of counter space will go a long way. Over cabinet door basket: These multi-purpose space savers can really be used anywhere in your home, but will save you a lot of space and keep you organized in the kitchen. Use an over the cabinet door basket under the sink to store cleaning supplies and easily accessible items, like sponges and dishwasher detergent. Kitchen Cart: It might not make sense to add a larger piece of furniture to an already small kitchen, but if you can, squeeze in a small kitchen cart. It will add another foot or two of counter space (a great place for that microwave) and doubles as a storage space underneath.